The English language is a funny thing. I never understood why some dishes that are sweet are called “salads”. It’s off-putting. It’s in the name. If you hear “strawberry pretzel salad”, what do you picture? I imagine a bowl of salad greens with strawberries and pretzels. No, thank you. Other examples of such salads are Jello salad, snickers salad, cookie salad and the list goes on and on. But after reading numerous blogs all featuring the same recipe and all with glowing reviews of how they grew up with this particular dish and how it’s everyone’s favorite at their family gathering, I broke down and had to try it. And after trying it myself, I can see why people would like it, especially with fresh strawberries. The pretzel crust is salty and crunchy, the cheesecake layer is smooth and creamy and the strawberry jello layer is fruity and refreshing. You pretty much hit every flavor profile. The best part? It’s super easy and the ingredient list is very short. Oh! Also, you only have to bake the pretzel crust for 10 minutes so your kitchen doesn’t get too hot. It’s a serious win-win-win situation. Preheat oven to 400˚F and prep a 9×13 inch baking dish by spraying the inside with nonstick spray. In a bowl, stir the pretzel crumbs and 3 tablespoons of sugar until well mixed. Pour the melted butter over the pretzel mixture and stir until evenly coated. Press the pretzel crumb mixture into the bottom of the baking dish, pressing it down with a spatula to form an even layer. Bake for 10 minutes, or until golden brown and cool completely. 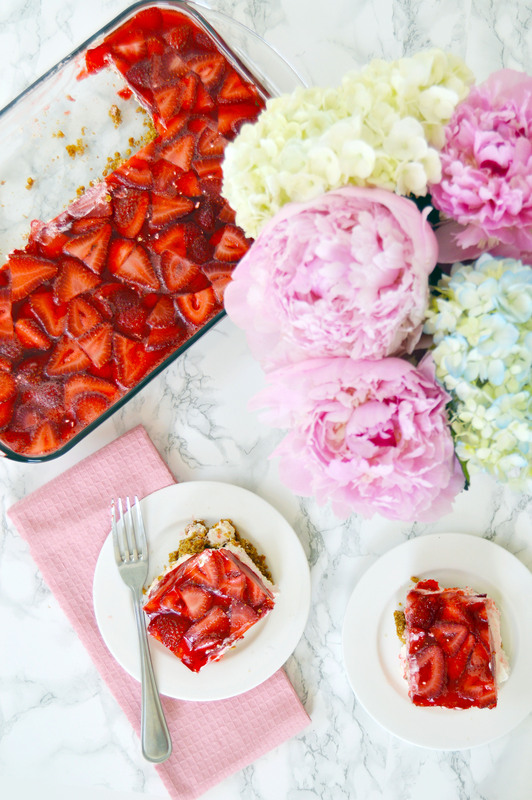 Refrigerate crust while you prep the strawberry layer. 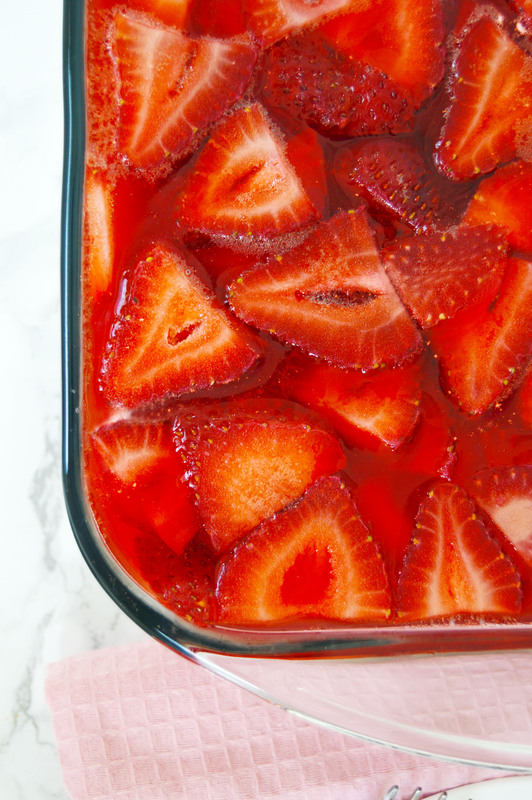 Stir in fresh strawberries into the jello mixture and carefully pour over the prepared cream cheese layer and refrigerate for at least 3 hours or until the strawberry layer is set. If you wiped the sides clean as suggested in step 6, the strawberry layer should set to a glass-like finish. This entry was posted in Cheesecake, Desserts, Fruit, Strawberry, Summer and tagged cheesecake, Jello, pretzel, salad, squares, strawberry. Bookmark the permalink. 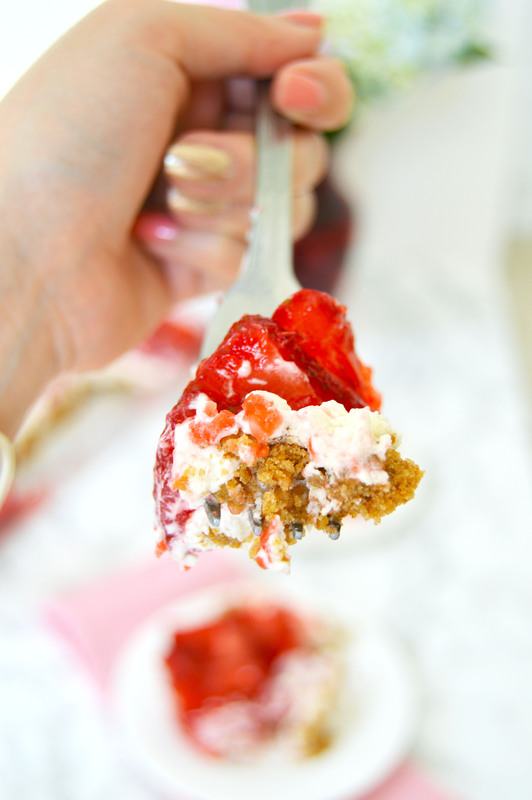 I’ve never been interested in strawberry pretzel salad until now. You make it look and sound delicious! ❤ Thank you, Lily! The fresh strawberries really makes it look more appetizing!